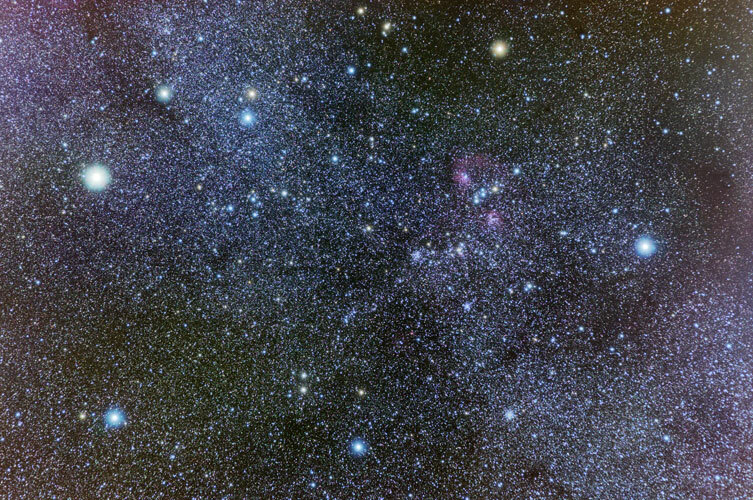 Auriga, "The Charioteer," is dominated by the yellow star Capella, the sixth-brightest star in the night sky, shining at magnitude 0.08 and located 42 light-years from the solar system. North is to the left of the image. Auriga contains three bright open clusters, M38, M36, and M37, seen here extending downward from the center of the image. The red emission nebula IC 405 is right of center with emission nebula IC 410 below and to the right. Technical Notes: A diffusion filter was used for three exposures for each channel to enhance the bright stars. Separate LRGB composites were created for the unfiltered and filtered images. The LRGB images were blended using the Lighten function in Photoshop CS2. Gradients were removed using Russell Croman's GradientXTerminator plug-in for Photoshop.